Lincolnshire farmers are stepping in to help support Lincoln Cathedral with a new initiative, as the iconic building may lose one of its grants. Lincoln Cathedral, a building that marked as “at risk” by English Heritage, is likely to lose an annual £250,000 grant from the organisation. The cut in funding is due to restructures within English Heritage. The new initiative started off with an official launch at the Cathedral Centre on November 27. In the lead up, local farmers have been raising money at popular markets and events. Lincolnshire farmers are pledging a tank of grain each from this year’s good harvest to raise money towards the necessary restoration of the northwest turret, where the Swineherd of Stow sits. The initiative is inspired by the story of the ‘swineherd’, whereby a poor man gave his life savings towards the restoration of the cathedral at the end of the 12th century, following an earthquake. Lincolnshire Agricultural Society Trustee Chris Rothery, a former agricultural machinery dealer, has been helping to promote the new initiative and local farmer Andrew Dennis, from Woodlands Organic Farms, has also played a part. He has spoken to the county’s grain merchants who have also pledged their support. 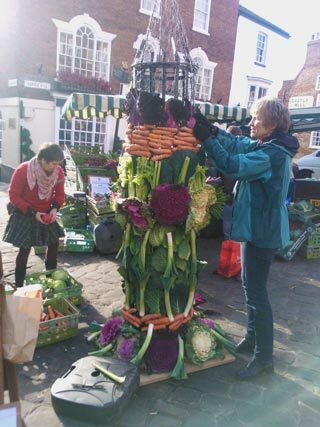 Perhaps you saw Andrew Dennis as his Woodlands Farm team build a turret of vegetables at Lincoln Farmers Market? 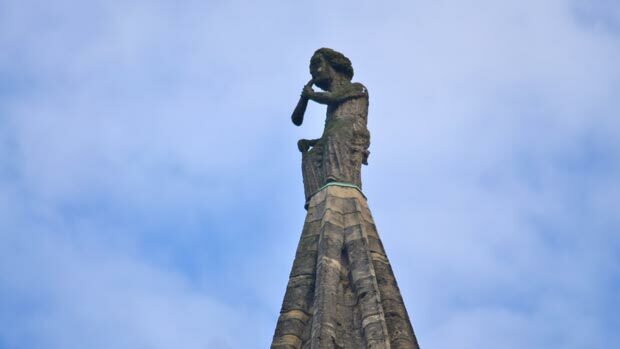 The proceeds of any carrots sold went towards the Lincoln Cathedral northwest turret renovation fund. The Dean added: “I was pleased to welcome a group of farmers to look around the cathedral. “When I told them about the challenges we face they were quick to respond with a suggestion of support.